This dilapidated house on Denton is slated to be demolished thanks to a federal grant the city won. Hamtramck got an early Christmas present. 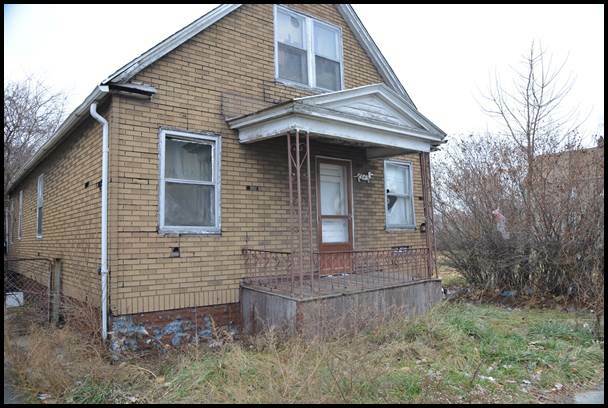 It was announced this week that the city will receive nearly $1 million from a federal grant to fight blight. “It’s a great day for Hamtramck,” she added. Angerer, who applied for the grant, said the money will be used to tear down 64 dilapidated houses. Hamtramck was one of 12 cities in the state to share a $75 million grant. Not surprisingly, Detroit received the bulk of the grant, $50 million. Highland Park received $5 million, but has far more structures to tear down compared to Hamtramck. The city has 18 months to spend the grant. The first step, Angerer said, is to finalize the city’s partnership with the Michigan Land Bank. Before the city can demolish the first house, the deeds and titles must be turned over to the Michigan Land Bank. One requirement for the grant called for a separate entity to take ownership of the blighted properties. “We’ve already done some of the leg work,” Angerer said. For the past few years Hamtramck has been aggressively going after blight and building new homes in vacant lots. While this grant, worth over $952,000, will go a long way toward wiping out the problem, Angerer said there will still remain some problem properties. She said the priority properties are those near schools and parks. “The goal is to stabilize the neighborhoods,” Angerer said. One such house is directly across from Hanley Academy on Denton. It’s a fake brick wrapped house that could be a poster house for blight. “It’s where kids walk past every day,” Angerer said. Pingback: Linkage: Art Van Mansion Sold; Silverdome Still Looks Awful; More!